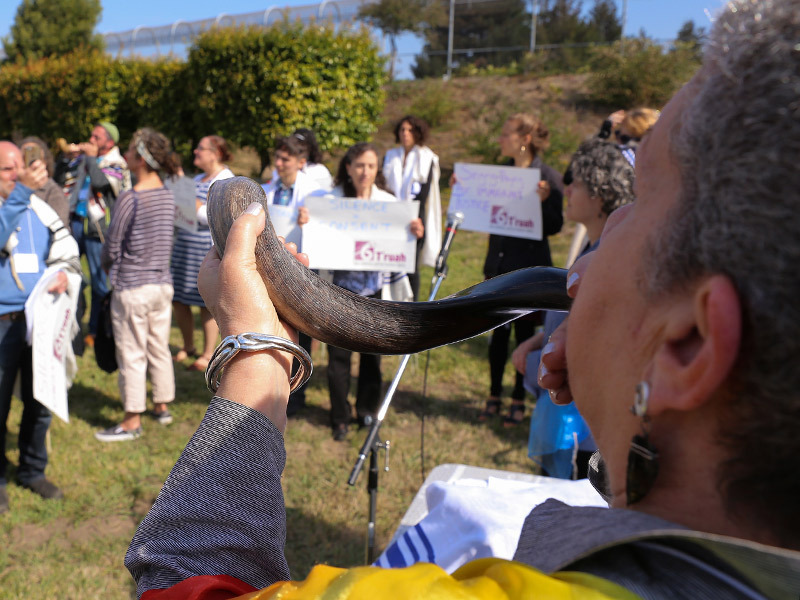 (RNS) — As Jews gather in synagogues to mark Rosh Hashanah, the Jewish New Year, they will hear the blast of the shofar or ram’s horn, a mournful shriek intended to wake them up. This year, that wake-up call may be louder than usual. Rabbis have always seen their High Holy Day sermons as an opportunity to deliver a potent and impassioned plea during the year’s most sacred season and at a time when sanctuaries are filled to capacity. But this year rabbis across the spectrum say they feel a particular urgency to rouse their congregants to action. In the nine months since President Trump took office, the Muslim travel ban, the attempted repeal of the Affordable Care Act, the rescinding of the Deferred Action on Childhood Arrivals, or DACA, program and most especially the anti-Semitic Charlottesville, Va., protest have forced many congregational leaders to rethink the rules. To many of the nation’s rabbis, most of whom opposed Trump in the general election and skew liberal on social issues, the Republican administration’s actions have been deeply disturbing. So much so, that a group of Reform rabbis meeting in a closed Facebook page drafted a joint sermon they expect will be used by hundreds of rabbis on Rosh Hashanah, which begins Wednesday evening (Sept. 20). In February, dozens of rabbis were arrested for refusing to disperse outside the Trump International Hotel in New York City over objections to the travel ban. Some 65 Jewish synagogues declared themselves “sanctuary” congregations willing to take in undocumented immigrants at risk of deportation. And Jews, and rabbis in particular, came out in force for Al Sharpton’s Thousand Minister March for Justice in Washington last month. 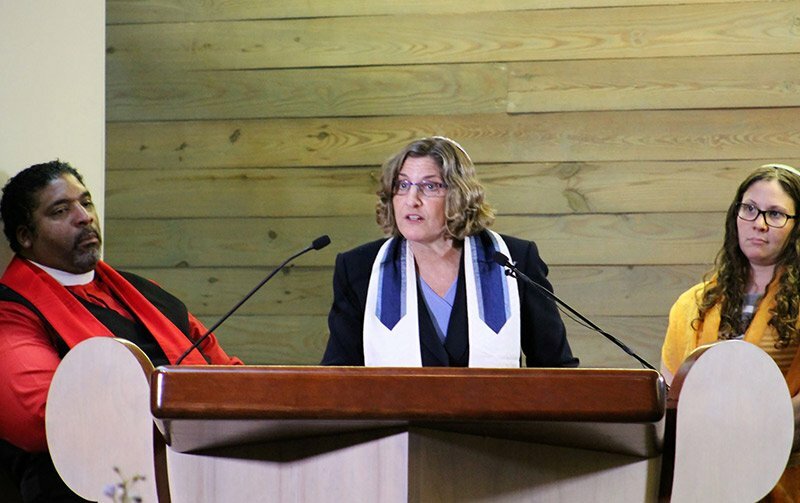 “I’m finding nationally within the rabbinic movement and locally with colleagues from all faiths, including many who have not been involved in social justice, that now is the time we cannot be silent,” said Rabbi Lucy Dinner of Temple Beth Or in Raleigh, N.C., who chairs the national Reform movement’s Committee on Peace, Justice and Civil Rights. But while three-quarters of the U.S. Jewish population align with the Democratic Party, nearly a quarter, or 24 percent, voted Republican in 2016, according to exit polls — the majority of them Orthodox Jews, who skew conservative. And even in the more liberal Reform, Conservative and Reconstructionist congregations, there are handfuls of Trump supporters. So in addition to the social action, this year also saw the debate over whether rabbis should get involved in social justice — or politics more generally — spill out into the open. 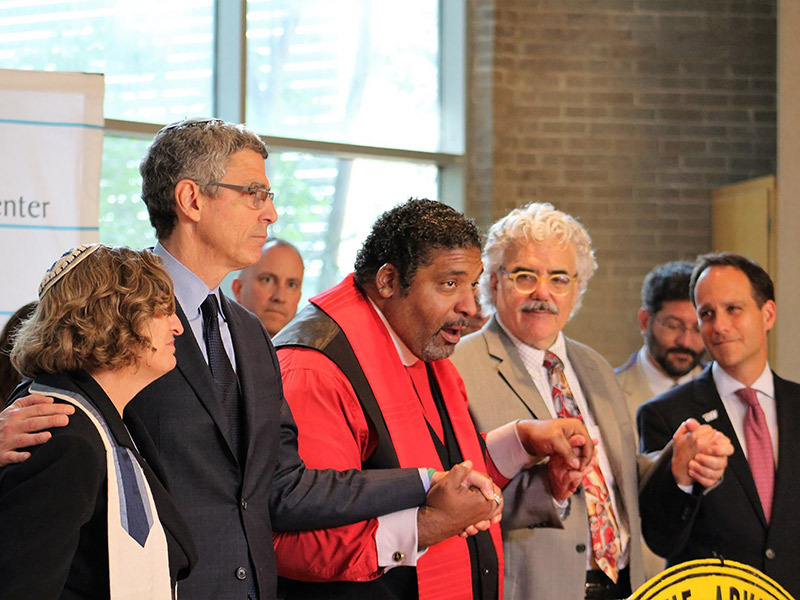 For many members of Reform Jewish congregations, who make up the largest of the U.S. Jewish movements, with 2 million people in 900 congregations, the answer is an emphatic “yes.” Many Reform Jews view social justice as the glue that binds them to their faith. “Tikkun olam” in Hebrew, or “repairing the world,” is what animates their Jewish identity. For other Jews (and some in the Reform movement, too), tradition, ritual, beliefs, heritage and culture are the portals through which they water their faith. To be sure, rabbis generally avoid political endorsements and many say they speak out about issues, not parties. But even advocacy in support of social justice causes can seem polarizing, said Brad Hirschfield, an Orthodox rabbi and the president of CLAL –The National Jewish Center for Learning and Leadership, a New York-based think tank and consulting organization committed to religious pluralism. Congregants in Orthodox synagogues, which make up about 10 percent of the estimated 5.3 million U.S. Jewish population, are unlikely to hear the clarion call to resist the policies of the current administration on Rosh Hashanah. These Jews tend to identify as Republicans and take conservative positions on social issues such as homosexuality, women’s rights, Muslims and the Israeli-Palestinian conflict. This community looks inward, tries to follow halakhah, or Jewish law, and keeps the Sabbath and dietary laws. “The community has been very disengaged from universalistic concerns,” said Rabbi Shmuly Yanklowitz, an Orthodox rabbi and founder of Uri L’Tzedek, a movement that advocates for social justice. That makes talking about the issues difficult, said Rabbi Haim Ovadia of Magen David Sephardic Congregation in Rockville, Md. “If I talk about social issues and they feel I’m preaching to them contrary to their opinion, they’ll say, ‘He’s manipulating us or telling us what to do,’” Ovadia said. For the most part, that’s not a problem for Rabbi Suzanne Singer of Riverside’s Temple Beth El, a Reform synagogue. She plans on speaking about social justice in two of her four High Holy Day sermons. Singer has a few Trump supporters in her congregation, but most members have been more interested this year in countering the president’s policies, by collecting household items for refugees, teaching them English and teaming up with Reform California, a project of the Religious Action Center of Reform Judaism that champions bills in the state Legislature that reflect Jewish values. Every minister has the right and obligation to express the values of his/her personal faith from the pulpit, though such expression is bound to ruffle somebody’s feathers somewhere. I think there has to be a good mix of action and the spiritual. We need spiritual sustenance at a time like this or we could burn out or start hating the other side. Stanger yet, the shofar has absolutely NOTHING to do with symbolizing “messiah”, and the “folks” who believe that the messiah already came have nothing to do with Jews or Rosh Hashanah. Do you practice being so consistently wrong, or does this come naturally?